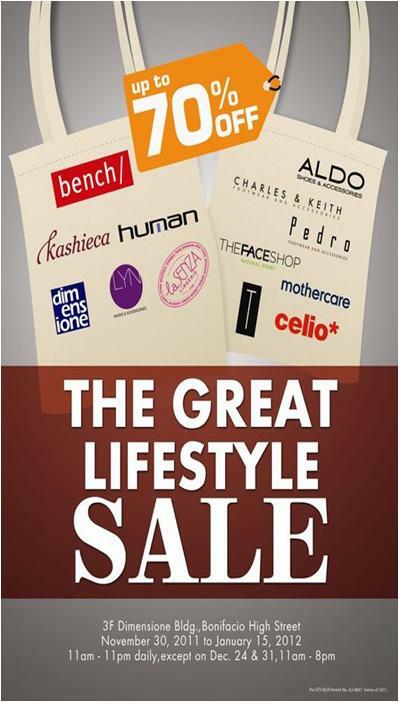 The Great Lifestyle Sale is from November 30, 2011 to January 15, 2012. Up to 70% OFF on selected items and brands. Brands on Sale include Bench, Kashieca, Human, Dimensione, Lyn Shoes and Accessories, La Senza Lingerie, Aldo, Charles & Keith, Pedro, The Face Shop, Mothercare, T and Celio.